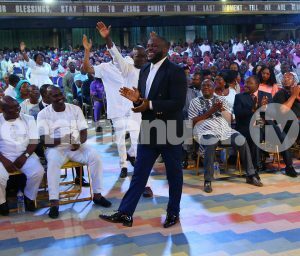 The Lord’s presence was evident at The SCOAN Sunday Service as Prophet T.B. Joshua, under the influence of the Holy Spirit, ministered healing, prophecy and deliverance. The lives of people were impacted in a radical way and the history of their lives re-written for the glory of God. 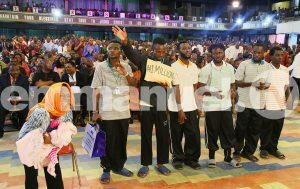 A time of Mass Prayer was conducted by the man of God and people were set free from the chains of captivity as they vomited blood and poisonous substances deposited in their system. 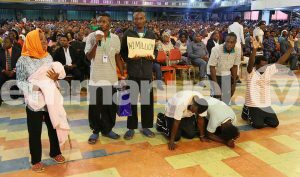 Evil spirits were cast out and testimonies restored, in Jesus’ name. Indeed, it was a new dawn to their health, finances, careers and lives. 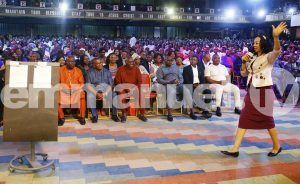 Participants in the auditorium of The SCOAN and viewers all over the world watching the live Sunday Service through Emmanuel TV listened to many uplifting testimonies. Here are just a few. Confined to a wheelchair due to a deep venous thrombosis that had weakened her bones, Miss Esther Ochonogor from Delta had to rely on her sister to assist her in doing everything. 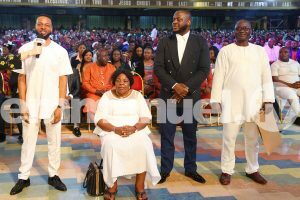 Having been to various hospitals without a solution, she was conveyed in a vehicle to The SCOAN for divine healing. As Prophet T.B. 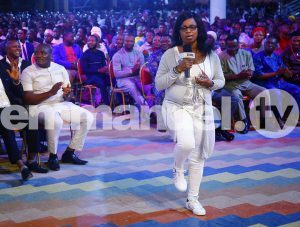 Joshua prayed for her, the healing hand of God removed the root cause of her problem and instantly, Miss Ochonogor stood on her feet and started walking freely again to the glory of God. “The heaviness and pain left me,” she testified excitedly. From 2011 to 2013, young Godstrust suffered immense pain as his body plagued with unending sickness associated with the kidney problem he was having. He was forced to take a total of twenty-four different medications a day. His eyes and entire body was swollen beyond recognition, making it painful to wear clothes. His condition confined him to the four walls of his room as he had to live in total isolation. After going far and wide in search of a solution all to no avail, Mrs Okpo brought her son before the Lord for His healing touch. 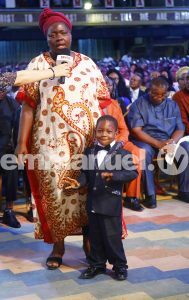 Coming to The SCOAN, Mrs Okpo received the New Morning Water which she ministered on her son, in Jesus’ name. To the family’s great relief, the swelling immediately came down as his kidneys began functioning normally. 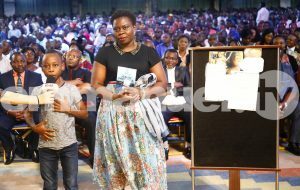 All signs of sicknesses were washed away through the ministration the New Morning Water and a healthy young man stood beside his mother to share his testimony to the glory of God during the The SCOAN Sunday Live Service. Truly, we serve a God who rescues, delivers and saves. Miss Joy Bongos, a Ghanaian, suffered from a terrible lung infection that prevented her from sleeping for a period of four years. The condition of her lungs was worsened by a terrible cough she suffered. These ailments which put a halt to her activities at her work place, drove her to several hospitals and churches in search of a cure but all proved abortive. In an attempt to get rid of the cough, she would rub garlic all over her body and it became a permanent habit for her. 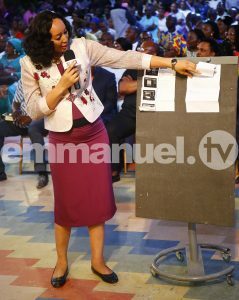 Egged on to receive her deliverance, she ran to The SCOAN and while the Mass Prayer was going on, God visited her where she was seated and she started vomiting blood and poisonous substances. As she spoke out during the Mass Prayer of her ordeal of inability to sleep, Prophet T.B. Joshua, in the name of Jesus, instructed her to sleep. Immediately, she fell into a deep sleep – this was something she was unable to achieve for many years. 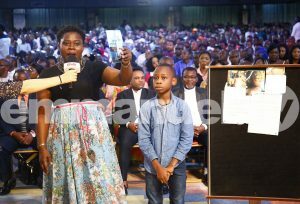 Miss Bongos testified during The SCOAN Live Sunday Service that after her deliverance that Sunday, she had a dream where she saw Prophet T.B. Joshua breaking off the chains that held her bound. “Believe in God and reach out by faith to touch Jesus wherever you are because distance is not a barrier,” she advised. Mrs Alberta watched over her three-year-old son with tears in her eyes as sicknesses were slowly encompassing every area of his life. Deformation of his knee bones caused him to wear metallic leg braces that went from his foot, all the way up his legs. After carrying Enock round various hospitals, Mrs Alberta was losing hope as her son’s case deteriorated and he was registered as disabled. Her house help had to back Enock to school every morning. 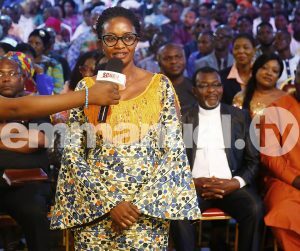 Mrs Alberta finally gained faith as she watched scores of others on Emmanuel TV receive miracles that had defied all odds. 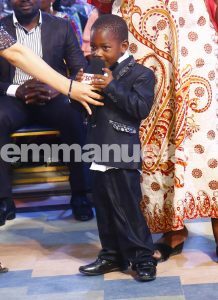 She brought young Enock to The SCOAN where he received prayer from Prophet T.B. Joshua. Mrs Alberta simultaneously received deliverance as her son received healing and within moments his leg braces were removed and he began running as he was healed! Mr Godwin Collins, marine logistics personnel, suffered setback in his business. Mr Collins witnessed an instant turnaround in his business after receiving prayers from Prophet T.B. Joshua and also the New Morning Water, which he ministered. Today, he can point to two vessels he has been able to acquire for the running of his business. He also has many employees. In his own words, “I was a nobody but I am now somebody”, Mr Godwin said. He was also reunited with his sister, Hannah Collins, resident in Germany whom he had lost contact with for over twenty years. 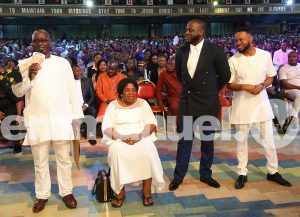 According to Mr Collins during his testimony at The SCOAN Sunday Service, after ministering the New Morning Water, he received news from his friend in Germany who told him he had seen his sister. Contacting the sister, he found out she was in a terrible health condition and had been confined to a wheelchair and on admission at a hospital, about to be operated. Having convinced her doctor to hold on with the operation, he took a flight to Germany and ministered the New Morning Water on his sister right in the presence of the doctors who were curious to see what would happen next. Alas! She rose to her feet and began to walk, as strength returned to her legs. It was a big surprise to the doctors and all around her. She was immediately discharged from the hospital as she was perfectly okay. 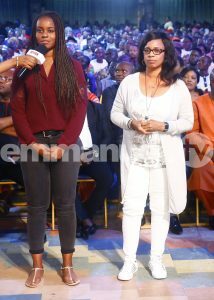 Hannah Collins testified during The SCOAN Sunday Live Service that she was once a dead living but today, she is alive, hale and hearty. To God be the Glory! At the age of 16, the young boarding school student, Onyekachi Agudosi, suddenly lost appetite. The sickness deteriorated and eventually, he could no longer walk. According to his doctors, it was a severe case of paralysis. He underwent one full month of acupuncture, with painful needles inserted throughout his body but Onyekachi was still nailed to his wheelchair, without any solution. Time went by and his condition became extremely pathetic as he could no longer feed himself with his own hand and he became very skinny. Not able to handle this situation any longer, Onyekachi started having suicidal thoughts. He actually attempted suicide twice but his father noticed and had to tie Onyekachi’s hands to the wheelchair to stop him. One day, Onyekachi’s best friend, Lucky, rang him and told him to come to The SCOAN. Onyekachi recalled that Lucky was the boy in his class who used to have Prophet T.B. Joshua’s sermon beside him all the time while he was always against Prophet T.B. 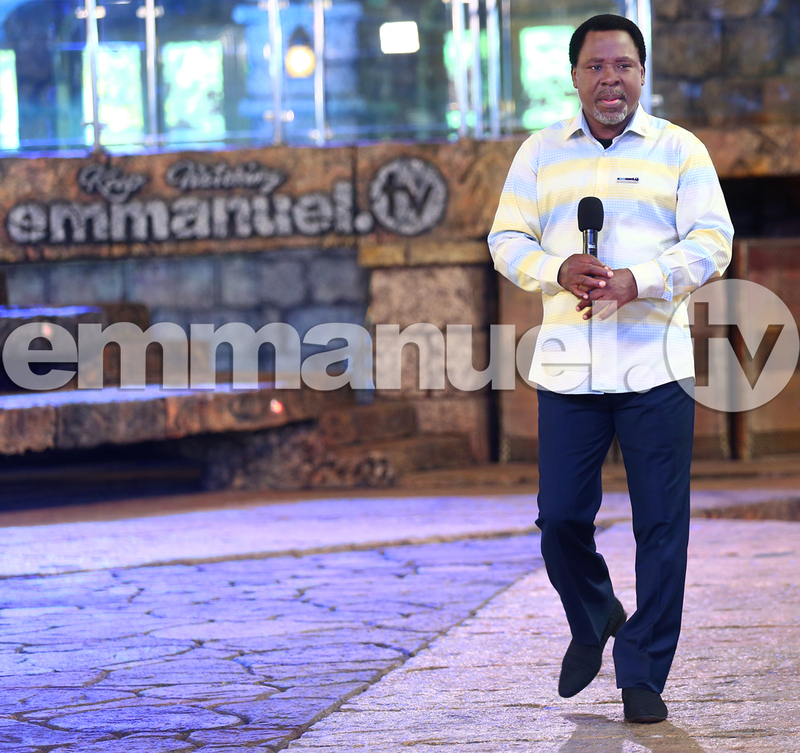 Joshua, The SCOAN and everything that had to do with the ministry. In this terrible condition, he still insisted that he would never come to The SCOAN. At a point, however, Onyekachi had a vision that changed his mind. In the vision, Prophet T.B. Joshua told him to walk and gave him financial assistance. When he woke up, he made this vision known to his mother and requested to be taken to The SCOAN. Onyekachi was wheeled to The SCOAN and placed at the Prayer Line. The moment Prophet T.B. Joshua prayed for him, his bones suddenly started aligning and Onyekachi began to feel his hands and feet once again. Strength came upon him and he stood up and started walking freely, entering the church without his wheelchair and without anybody’s assistance. After receiving his healing, Prophet T.B. Joshua assisted his parents financially to take care of Oyekachi. 13 years have passed and the young Onyekachi has turned into a healthy and successful businessman. This day, in company of his parents and longtime friend, Lucky, Onyekachi testifies to the goodness of God. Bursting into tears of joy as Onyekachi watched the video of when he came years ago; he could find no words to express his gratitude to God who raised his dry bones. “I started feeling alive…I regained weight in my body and started to recover; I started feeding myself. I could feel my legs and hands again,” Onyekachi testified of his experience after Prophet T.B. Joshua prayed for him thirteen years ago. Now, Mr Onyekachi who has graduated from a British university, married and been blessed with a son, testified that his life is a testimony. The same God who healed him in the past has blessed him in his business and marriage. A million thanks are not enough to express how grateful he is to God. Mr Gabriel Durojaiye, a scholar, was struck with a severe stomach pain which restricted him from going to school like his other mates. The pain affected him academically and his grades began to drop. He backslid, to the surprise of his family and the scholar they once knew kept coming home with poor grades. Perturbed by the ailment and low grades, his father hurriedly brought the New Morning Water and ministered it on his son. Mr Gabriel got back to his feet and the pain left him. Miraculously, not only was he healed, his academic performance also boosted, prompting him to win several scholastic awards. 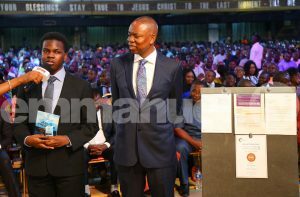 Now a strengthened young scholar, he was asked to represent his school in national competitions and by the grace of God, he emerged the winner. God further blessed him with a distinction in statistics and he was given conditional offers in the best five universities in the UK. To crown it all, he was offered an admission to Oxford University to study for a four-year Master’s Degree in Chemistry and also received an award for emerging the winner of the 50th International Chemistry Olympiad 2018. 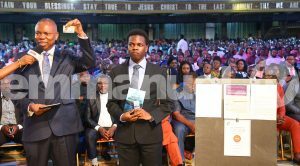 The father of the Oxford-bound student, Mr Samuel Durojaiye, attributed all success to the superior power of our Lord, Jesus Christ and testified as an example to all parents to continue to point their children in the way of the Lord. 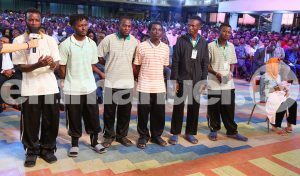 DEPORTEES FREED FROM HELL ON EARTH! Deportees from Libya spoke out of their ordeal. A group of three individuals had been kidnapped in Libya and bundled into an underground prison where people were bought and sold. “It was for business,” the deportee said. In desperation and with no-one to turn to, some of them used a phone to record a video, appealing for help and exposing the conditions they were being held in. The video was smuggled out and released on the internet and watched worldwide via social media. With the prayer and support of Prophet T.B. Joshua after watching the viral video of the Nigerians in the underground prison in Libya, the unseen Hand of God worked out the answer for their release. The prison owners also discovered the video. They investigated and sentenced the video’s ‘presenter’ Frank Isaiah, to death. He was taken to a backyard where they hung him overnight. The following day, they brought him down and took him to a forest where they had dug a shallow grave. As they were about to throw him into the grave, they found he was still breathing. He was taken back to the prison and told to pay a sum of money to release him from the jail. In the process of Frank calling loved ones back in Nigeria to rally round and gather the money, the International Organisation for Migration (IOM) came to the underground prison to aid the deportees. The Nigerians were called out and registered for deportation. When IOM arrived, as further punishment for Frank whose video revealed the whereabouts of the prison, the jail owners locked Frank away. One of his inmates informed the IOM who came back the following day and also registered Frank for deportation. They arrived in Nigeria on Friday 31st August 2018 and immediately came to The SCOAN for assistance. rrence took place. 122 of them were squashed onto a rubber boat and only four of them survived. As they described their experience on the sea, they recounted the horrific event that unfolded. The boat capsized, plunging hundreds to their watery grave. Bizarrely, as some of the drowning migrants disappeared into the ocean, they reappeared with demonic features, sharp fangs and claws, attacking other occupants of the boat struggling to survive. “As they attacked, the ones bitten would turn into vampires as well and bite others on the boat. 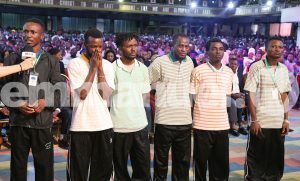 But when we called upon the God of Prophet T.B Joshua, we survived the horrendous incident”, they testified. Another one of the deportees, Miss Ada Johnson, recounted how she travelled down to Libya only to be taken in as a slave. With tears in her eyes, she revealed her experience with a stranger who took her in only to impregnate her. Unfortunately for her, in an attempt to travel out of Libya, she was kidnapped and taken to an illegal prison where humans were bought and sold. The stranger who promised to take her back to her country, escaped without a trace – leaving her behind pregnant. When the pregnancy was due, Miss Ada put to bed without any medical attention. Several days later, she was among those deported back to Nigeria – with a ten-day old baby and no knowledge of the father’s family or whereabouts. 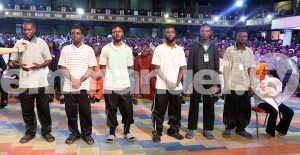 As God would have it, Prophet T.B Joshua and the Emmanuel TV partners blessed a group of 80 deportees on Friday with a sum of 2.4 million naira. 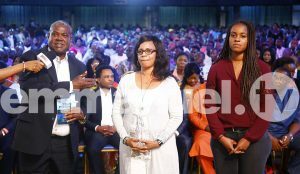 An additional amount of over 1 million naira was given to the deportees who shared their testimony on Sunday, to help them restart their lives in Nigeria after such a horrific ordeal. 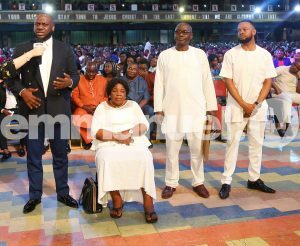 Each of the 6 men were given 150,000 naira and the woman and her child was given 200,000 naira totaling 1.1 million naira. To God be the glory.